The Kalisha duvet cover set from Dreams & Drapes is a reversible duvet cover, which gives you two different looks. 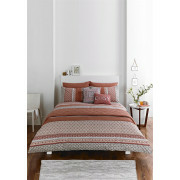 A rich and vibrant duvet cover that includes the matching pillowcase. Additional items from the Kalisha range are available to give your bedroom a makeover, like reversible quilted bedspread and extra pillowcases.